The Grand Rounds lecture traditionally offers medical professionals the opportunity to learn from colleagues about topics that may be outside of their direct specialty. By convention, topics have a scientific, rather than cultural, basis. Previous surgery Grand Rounds at UVa in 2014 included lectures on breast cancer treatments, donor lungs, clinical trials, and critical care. Rosenberger began with an explanation of the Anabaptist faith and the difference between the Mennonites and Amish. She then highlighted pacifism, a core belief of Anabaptism, and how this belief has shaped Mennonite contributions to the medical field. “There was a large movement to improve the conditions of mental health facilities for patients during this time, which can be traced to Mennonites and Quakers who had served in so many of these facilities,” she said. After graduation from EMU, Rosenberger completed her medical degree at Jefferson Medical College in Philadelphia, Pennsylvania. 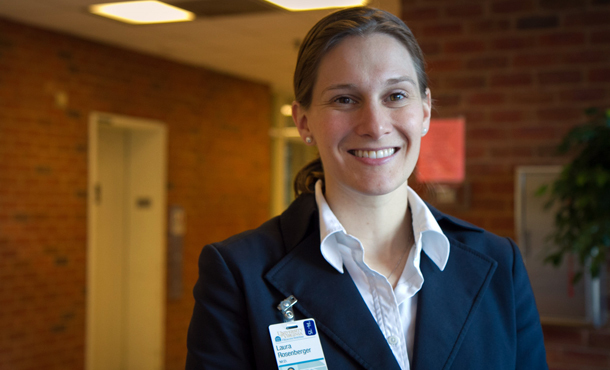 She has been a surgical resident at UVa since 2008, completing a master’s degree in clinical research in 2011 and being named chief resident in surgery in 2014. Next year she will complete a surgical fellowship in breast oncology at Memorial Sloan Kettering Cancer Center in New York City. Background note from the editor: Laura Rosenberger remains one of EMU’s top student-athletes ever. She won all six ODAC pole vault titles possible (indoor and outdoor) and was the national champion four times before her senior year. She stopped athletic competition her senior year to focus on academics in preparation for medical school. EMU inducted Rosenberger into the Athletics Hall of Honor in the fall of 2013.